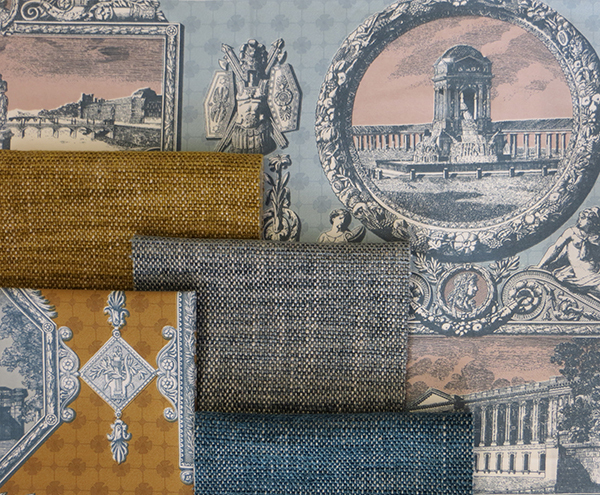 ‘Les Vues de Paris’ is a toile first designed in 1818 by the French neoclassical architect Hippolytes Le Bas. It features the city’s most notable monuments: the Pont Neuf; the Louvre; the Fountain of the Innocents; and the Pantheon. Historically, toiles were not just decorative but often served a didactic purpose and were even used for propaganda – in this case Le Bas sought to glorify the city via its elevated architecture. Marvic Textiles has reimagined this esteemed classic by recolouring the design, offering a bolder alternative to the existing sepia tones – pictured are Old Gold and Sky.